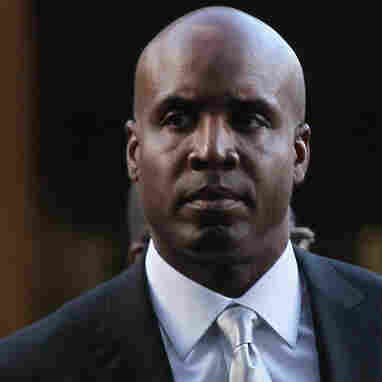 Jury Finds Barry Bonds Guilty Of Obstruction Of Justice : The Two-Way The jury was deadlocked on the other three charges of lying to a grand jury, so a judge declared a mistrial on those. A San Francisco jury found home-run king Barry Bonds guilty on one charge of obstruction of justice. The former Major League Baseball player faced three charges of lying to a grand jury in 2003 about his use of steroids and human growth hormone, but the jury could not reach a unanimous verdict on any of those counts. ESPN reports that the defense and prosecution agreed to accept a verdict on the one charge and a mistrial on the other three charges. Bonds sat stone-faced through the verdict, displaying noemotion. The case also represented the culmination of the federalinvestigation into the Bay Area Laboratory Co-Operative steroidsring. Federal prosecutors and the Justice Department will have todecide whether to retry Bonds on the unresolved counts. In his Major League career, Bonds hit more home runs than anyone else in baseball history. Dennis Riordan says Bonds was cleared of anything to do with steroids and injections, but convicted on a statement to the grand jury about being a "celebrity child." Prosecutor Matt Parrella says he was convicted of obstructing justice. The Los Angeles Times reports that the jury's decision makes Bonds a convicted felon. Each count against Bonds carries a maximum sentence of 10 years, but federal sentencing guidelines recommend 15 to 21 months in prison. USA Today reports Bonds will likely get probation. USA Today also reminds us that this case goes back to an investigation of the Bay Area Laboratory Co-Operative, which authorities said was selling designer steroids to athletes. Bonds became a target of the investigation after investigators learned he had appeared in an ad for the company. Throughout the trial Bonds maintained that he didn't know that what he was taking were steroids or human growth hormones. The Times adds: "Although given immunity in connection with illegal drug use, Bonds insisted that his trainer told him the two steroids he was taking were flaxseed oil and arthritis cream." Previous to him, Olympic gold medalist Marion Jones, Olympic cyclist Tammy Thomas, NFL lineman Dana Stubblefield and track coach Trevor Graham were convicted of making false statements to a grand jury or federal authorities. Bonds was found guilty of obstruction of justice, which The New York Times reports means, "the jury agreed that Bonds had misled or impeded a 2003 grand jury hearing evidence about steroid use by elite athletes." ESPN's T.J. Quinn reports that in the three other charges jurors were trying to decide if Bonds flat-out lied to a grand jury: first, about whether he knew that what was being given to him were steroids; second, whether he received an injection from anyone other than his personal physician; and the third whether he had taken human growth hormone.